30 Ngwee Tax, Tariff for Levy on Internet Call? Concern on the street is mirrored in markets. 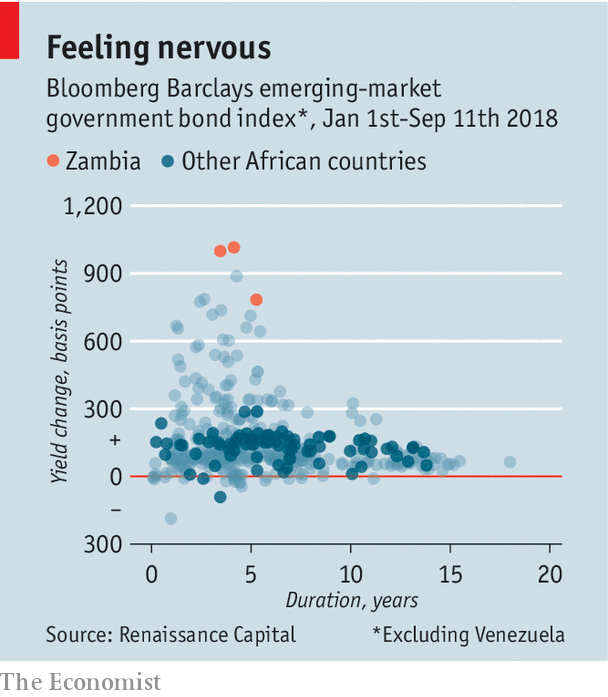 Of the 75 countries whose bonds make up the Bloomberg Barclays Emerging Markets Index, a basket of sovereign debt, none has performed as badly in 2018 as Zambia (see chart). Given crises in Argentina and Turkey, that is some achievement. “The market is pricing in a default,” notes Gregory Smith of Renaissance Capital, an investment bank. 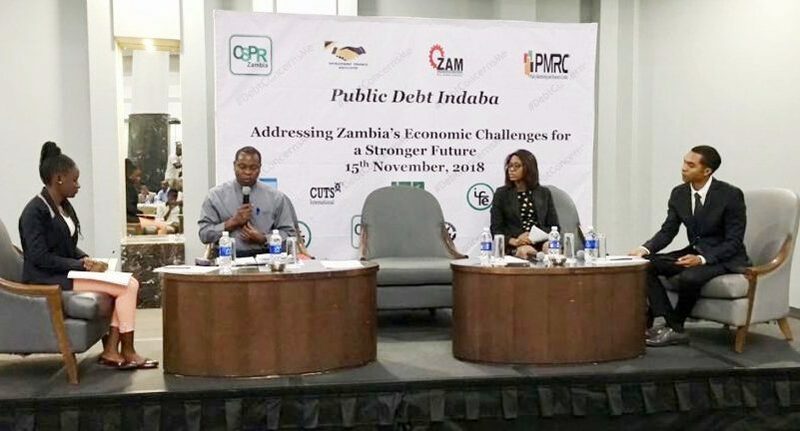 Zambia is therefore a warning for other African countries which also received debt forgiveness in 2005-06 but today find themselves on the verge of another crisis. Zambia’s economy made a good start to the century. Growth averaged more than 7% a year from 2000 to 2010, buoyed by high prices for copper, which makes up 80% of exports. (The top destination for Zambia’s exports is Switzerland—home to Glencore, a commodities trader.) The boom meant that aid, which amounted to 57% of national income in 1995, was just 5% by 2010. The boom ended in about 2011. Copper prices fell and growth slowed. The Patriotic Front (PF), which still rules Zambia, was elected that year. It soon embarked on a spending splurge. As well as new roads, hospitals and airports, the PF has almost doubled the civil-service wage bill in real terms and expanded the number of districts from 72 to 115 so as to dole out more patronage. ​Extra spending has been funded by borrowing. Public debt increased rapidly, from 21% of GDP in 2011 to 59% at the end of 2017. Roughly two-thirds of that borrowing is denominated in foreign currency and owed to Chinese creditors or Western investors who bought its Eurobonds: $3bn worth of dollar bonds issued in Europe. Paying back these debts is putting huge pressure on Zambia’s finances. The biggest item in the budget used to be education. Today it is debt service, with nearly a quarter of government spending going to pay back loans. The fiscal deficit for 2018 is set to be more than 9% of GDP. Civil servants were not paid on time last month. When pay was delayed last year a government spokesperson helpfully recommended that bureaucrats start breeding chickens. Arrears for government contractors are mounting. This in turn is hurting businesses. The share of bad loans on banks’ books has increased to 13% from 8% two years ago. Zambia is one of 18 African countries the IMF says is at risk of “debt distress”—double the number in 2013. A further eight are already in distress (meaning they are delinquent or in default). Yet Zambia is resisting the fund’s call for restraint and relations with it have all but broken down. Talks over a bailout are on ice and, under pressure from Zambia, the IMF has reassigned its representative. It is not as if the money has been well spent. Much has been spent haphazardly—or, in some cases, stolen. “People are asking: where did all the money go?” says Geoffrey Chongo of the Jesuit Centre for Theological Reflection, a local charity. One answer is tarmac. Since 2011 Zambia has announced plans to build 9,000km of roads. Few doubt the need for better infrastructure. But the country has overpaid. A study by the World Bank in 2017 found that Zambia paid $360,000 per kilometre, which is more than twice the African average. And since upkeep has been neglected, many new roads are already potholed. Other deals have been similarly wasteful. Zambia bought 42 fire engines for $1m each—a 70% mark-up. And it has regularly paid over the odds for infrastructure built by state-owned Chinese companies. Take the contract for the new airport terminal in Lusaka (known locally as “the hamburger” though it looks more like a baosandwich), which has been designed to accommodate a rather improbable ten-fold increase in passenger traffic. These deals are opaque. Typically loans are agreed between Zambian government departments and China’s Export-Import Bank, which then lends directly to the Chinese contractor. Only later, if at all, are the true costs revealed. Many worry that some deals remain undisclosed, and that President Edgar Lungu will hand over state assets such as ZESCO, the energy utility, to China in exchange for debt relief. A Zambian delegation returned last week from Beijing, where it attended the triennial summit of Chinese and African leaders. Many Zambians resent the Chinese influence. Businessmen, for instance, complain that they are locked out of the best contracts. Privately, though, Zambia’s elites are more likely to blame their government than the Chinese. Under the PF, governance is weak and venal. Reports from Zambia’s Auditor-General and the Financial Intelligence Centre, an ombudsman, suggest that corruption has increased markedly under Mr Lungu’s regime. One economist who has studied road deals estimates that 5-10% is skimmed off the top. Defenders of Mr Lungu reckon that Zambia has time on its side. The principal on the first of its three Eurobonds is not due until 2022. China may extend the terms of its credit. But given the rising debt burden, Zambia cannot go on as it is. Later this month the government will outline its budget for 2019; investors and the IMF will be watching to see if there is any sign of change from Mr Lungu and his cronies. If not, 12 years after the world forgave its loans, Zambia will keep heading towards another debt crisis. ​In the recent past, between January and June Zambia experienced a crisis in increased prices of tomatoes and onion on the market. During that period a box of tomatoes at Soweto market was costing above K100. The exorbitant price of tomatoes and onions affected thousands of families throughout the country because the two commodities are basic necessities in households. The cost of tomatoes and onions increased from K9 in January to K17 in April per Kg and from K9 in January to K13 in April respectively. Reduced supply in tomatoes and onions during that period was attributed to poor rainfall pattern. ​Releasing the August 2018 Basic Needs Basket (BNB), the Jesuit Centre for Theological Reflection (JCTR), has observed that a box of tomatoes and onions in Soweto market is currently selling at K25 and K35 respectively. The favourable prices of these two agriculture produce on the market have been attributed to high supply emanating from favourable farming conditions However, the Centre has noted that the cost of living for a family of five living in Lusaka has remained high at K5,402.31, reflecting an increase of K146 from the July figure of K5,256.29. Significant increases in prices were noted in Kapenta which increased by K78 from K152 in July to K230 in August per kg whilst a Kilogram of Beans increased by K3 from K29 in July to K32 in August. Reductions were recorded in the prices of Beef by K8 from K39 in July to K31 in August per kg. A kilogram of tomatoes decreased by K2 from K5 in July to K3 in August per kg. Access to food is a basic human right and thus important for good health and ultimately for life itself. The JCTR is however concerned that despite reductions recorded in commodity prices such as tomatoes and onions, the cost of living has remained high and unaffordable for most households. The Centre is further dismayed that despite scoring a good harvest in the production of tomatoes and onions, most of the produce is going to waste. This is largely attributed to infrastructure constraints related to poor transport, storage, processing, packaging facilities and importation of tomatoes and onions on the market. The JCTR is there calling on Government to expedite promotion of value addition in the country, through activities such as production planning, sorting and research. The Centre is further urging government to improvise storage facilities and infrastructure in areas of production, for example more feeder roads should be provided to allow producers to have easier access to markets. The Centre is also urging government to embrace regional integration which will enhance exports and create market for excess food commodities. Further, the JCTR has urged government to promote constant adequate supply of basic essentials such as tomatoes, Kapenta, etc. but more also to facilitate that they are produced at a low cost and their production widely spread in most corners of the country. The Centre feels such a measure would help to contain the skyrocketing cost of living.